Petr Horacek is one of the loveliest illustrators around and his children's books are a sumptuous feast for the senses, with their rich colours, paper engineering and engaging text. 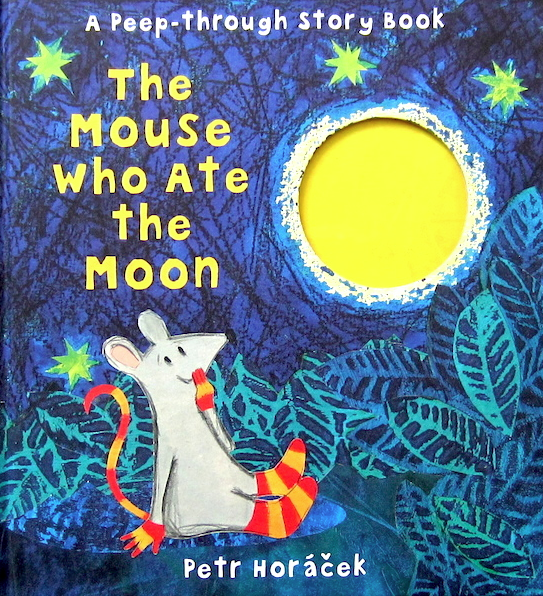 Today his latest title The Mouse Who Ate the Moon has been published by Walker Books, heralded by The Times as their Children's Book of the Week. We were delighted to receive a sneak peek of this gorgeous little tale and Culturebaby has read and re-read it over the last few days. Your little ones may have been lucky enough to meet this endearing rodent before in Petr's A New House for Mouse. Making the chance find of a delicious looking apple, mouse goes in search of a burrow large enough to accommodate both herself and her dinner. This search proved hungry work and ultimately, though her search was fruitless *chortle*, she snacked so hard that she discovered that her humble little burrow was the best for her and her remaining core. 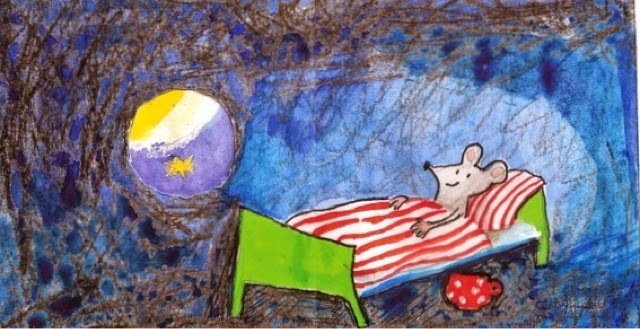 This time, in another fruity tale, mouse dreams of owning her very own piece of the moon she admires. 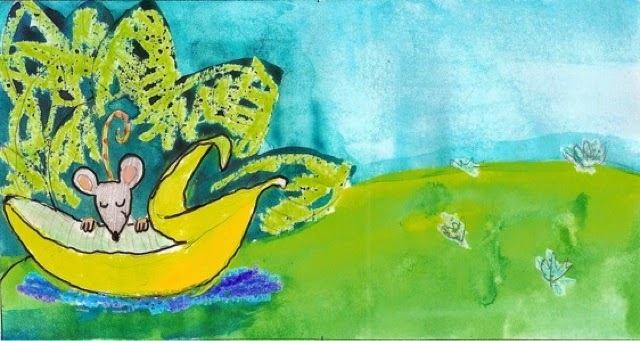 Discovering a banana outside of her burrow, she mistakenly believes her wish has come true. The moon, however, smells and tastes delicious and soon mouse, to her consequent despair, has eaten part of it. It will never be round again! Happily her friends come to the rescue and teach mouse some basic astronomy and in return they share a feast. This story is lovely. 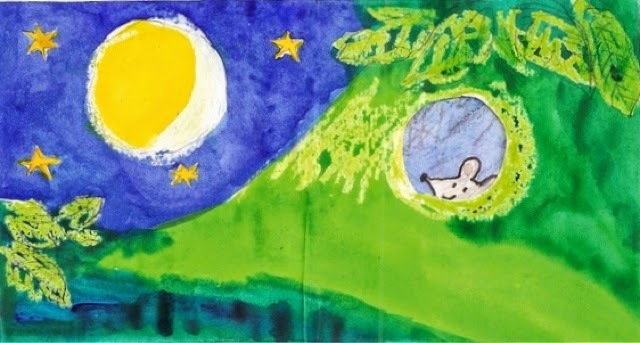 It introduces a sense of awe about the wonder of the night sky, concepts of friendship and kindness and is so beautifully illustrated that you too may be induced to gobble it up. There is a depth and richness about Petr's illustrations and Culturebaby realised with delight that she or I could peer through the cut-out sections as we shared the story together. This immediately captured her interest and consequently she listened intently to the whole story. As a treat for the launch of this little gem, we were sent a number of Petr's beautiful sketches to share with you from his preparations for the book. These show how he builds colour and texture with paint into his images and how he begins to develop his characters. I've always had rather a thing about sketches in art galleries. Unlike the finished works they often betray more of the intricate design process, and somehow feel more real; rather like you are peering into a diary and privy to the private thoughts of the artist. I love these sketches and can well imagine that they could inspire little paws to have a go at creating their own woodland characters too. 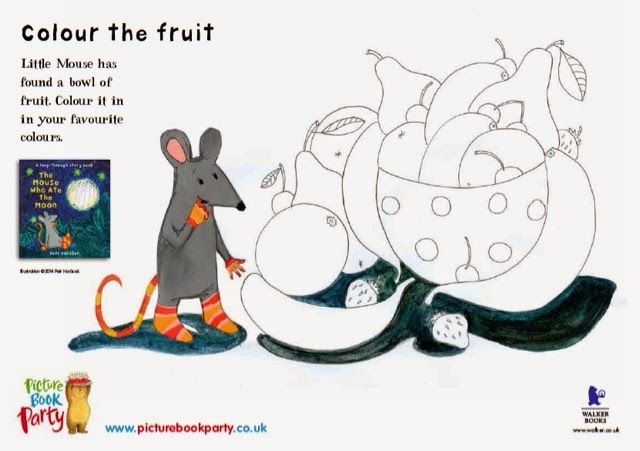 We were also sent a themed activity sheet to accompany the book, complete with a feast of fruit to colour in. You can download this free, and three other activity sheets here. There is also a make-your-own mouse mask template here. 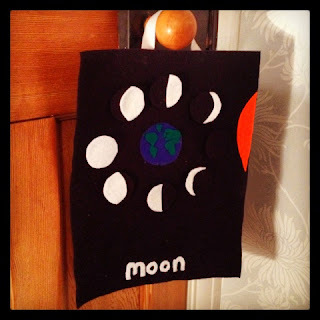 To celebrate the launch of this book I thought it would be a great opportunity to begin exploring the phases of the moon with Culturebaby. A little while ago I bought her a gorgeous fabric wall calendar, which also depicts the weather. She's become really fascinated by it and rather amusingly has taken to talking herself to sleep by listing the days of the week and our corresponding activities. It has also made her really observe the weather outside and she toddles over to her calendar several times some days to change the symbols depending on the outdoor conditions. 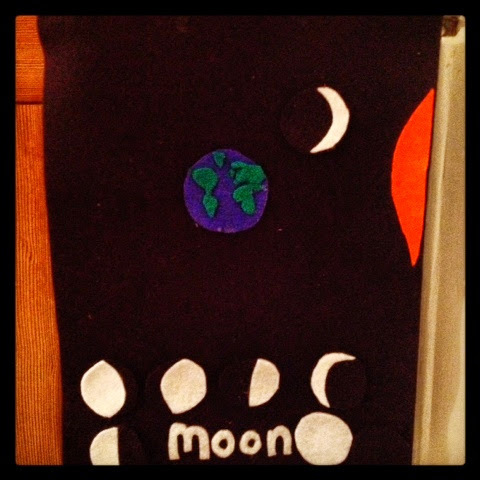 With this in mind, I created a wall chart from felt for us to use to look at the night sky and map the phases of the moon.